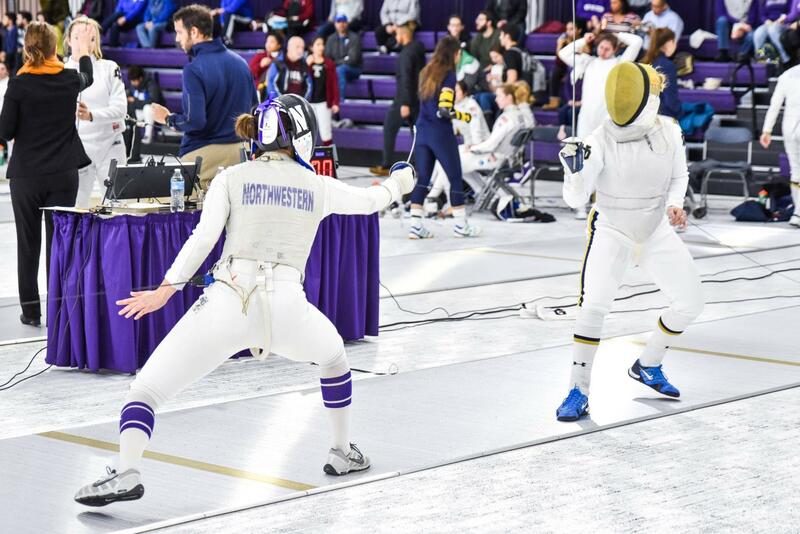 A Northwestern fencer faces off with her opponent. The Wildcats will send 5 fencers to the NCAA Championships. The biggest stage in college fencing has arrived, and Northwestern is looking to make history. Coach Zach Moss and his team have one goal that has never been accomplished by the Wildcats: Finish top-five in the nation. No. 5 NU is sending five fencers to the NCAA Championships in Cleveland this weekend. They will compete as individuals in 23 bouts over two days, earning points toward the Cats’ final team ranking. Freshman Julia Falinska and junior Pauline Hamilton will represent NU in epée. Freshman Alyssa Chen and senior Yvonne Chart will compete in foil, and graduate Emine Yücel will compete in sabre. NU had hoped to send the maximum six fencers on from Midwest Regionals to the NCAA Championships, but fell one sabre short. This will mean the Cats have to be at the top of their game: Every individual bout win counts for team points, and No. 1 Notre Dame, No. 2 Columbia, No. 3 Penn State, No. 4 Harvard and No. 7 St. John’s will each have six fencers competing. Chart, who was an All-American last year after her 12th-place finish, said she thinks the Cats can step over a few of the teams with more competitors. She also said that despite the individual bouts, she takes on NCAA Championships with a team mindset. “That’s what pulled me through all the tough losses (last year). I’m not fighting for myself, I’m fighting for the team,” she said. Moss stressed that the team is focused, above all else, on the overall results. He estimates that every one of his fencers will need to achieve or come close to achieving All-American honors — top-12 in their weapon style. The pressure is high, but Moss said that sticking to the process they’ve learned will help the fencers. “Just consistency. That’s what we train for all season and that’s what we’re going to continue to focus on,” he said. Moss and assistant coach Eric Momberg, in an effort to shoulder some of the mental load, craft gameplans for every opponent using film in their database. NU has faced many of the schools throughout the season, but Harvard and St. Johns in particular will be new challenges. The coaches will give the game-plan for an opponent to the fencer just before they step onto the strip for each bout. Hamilton will bring a veteran presence — this will be her third straight NCAA Championships appearance. The junior epée placed 2nd at the Midwest Conference Championships in February and 5th at the Midwest Regionals. Falinska and Chen are the only two underclassmen in NU’s group, and the only two without NCAA Championships experience. Falinska said that qualifying for the top college meet was a great feeling, but going in she was thinking about her supportive teammates in Evanston.